Not a single wink, not a single distraction and not a single movement; just like the finals of CSK match, I was sitting at the edge of my seat when I watched Shamitabh’s trailer. Unknowingly, I was engrossed into the trailer. This heavy rush is not for Dhanush or Amitabh, but I watched it to see how Balki has given his magical touch in recreating these personalities to his characters. With Balki’s story telling and movie making skills, this 2:08 secs video was exhilarating, liberating and invigorating. 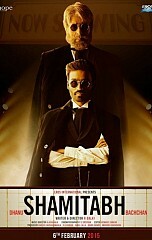 The trailer opens with Amitabh Bachchan’s voice over saying ‘Sha-mi-tab’ overlaid with Dhanush’s different get-up. With a gripping screenplay, the visuals then continue to show Dhanush’s stardom. An actor is transformed into a star. Dhanush’s screen presence is extremely convincing. Are we getting deceived by this success? Right when we start to think the reason behind Dhanush’s glory, marks an unflinching entry of Amitabh Bachchan. The first dialogue he says is ‘main bhi Shamitabh hoon’ (I am also… Shamitabh). Shamitabh sure sounds like a culmination of two names. As expected, Amitabh seems to share his name with Dhanush. As a fan of two of Balki’s previous movies (Cheeni Kum and Paa), I expected a different love, a child’s philosophy about life and a strong old man or woman’s point of view. Any typical Balki’s film will consist of these elements. But Shamitabh shows that Balki is out to provide a different look and feel and a unique delivery for his audience. The trailer did portray its auteur’s traits like rigid lead role, high intensity ego, strange relationships, the love-hate bond and most importantly, novelty behind the idea. The main element that serves as an irreplaceable and stable factor in his movies is the Amitabh-Ilayaraja combo. This pair has worked its best in Shamitabh too. The entire trailer was tucked beneath the title track which is mesmerizing and scintillating. The song keeps ringing in your mind even after the trailer gets over. It clearly communicates the SH-AMITABH behind Shamitabh. While the first half of the trailer is stolen by Dhanush’s catharsis and unwavering acting, the second half is shouldered by Amitabh’s undeceived performance. The legendary actor goes in full throttle and the trailer sets a high pace to unveil and conceal at the same time. Akshara Hassan’s delivery definitely doesn’t feel like a first timer. Once the trailer gets over one may feel that he or she knows a lot about the story as we see ego clash, a mentor-mentee relationship, stardom and the journey to success but when we sit down to knit the thread, we may feel that we don’t know anything as simple as the two character’s names. This suspense has instilled more curiosity in me and now I can’t wait for February 6th for Balki’s feast, the phenomenal experience watching his film and the uncompromising need to get a complete overdose for watching the film more than just once.